Google social search now live! As you can see, there are a range of results, mostly from Twitter as they do not use FriendFeed. The great thing about social search is that it is bespoke to the user that has signed in. 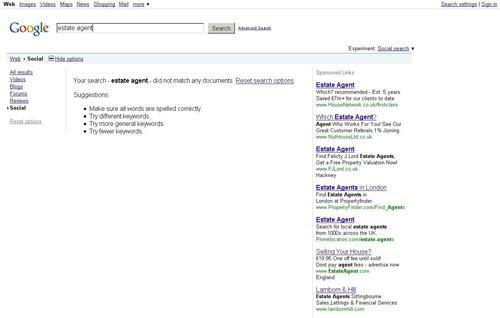 An important note here is that estate agents wanting to use Social Search must have a Google account. That Google account must either have contacts and/or linked to social networks otherwise the search feature will not work. As you can see above, the same search term was placed into Google Social Search but it did not reveal any results. Another important note is that this feature does not search in real time. That means that a friend or contact's Tweets on Twitter will not instantly be searchable through Social Search. There is a big chance that will be in the works, watch this space. Have you tried out Google Social Search? What search terms have you put in? Give us feedback on our Facebook Fan pageTwitter profile!